Phil and Becky Petersen with their Space Shuttle Cafe. Lately, there have been some strange sightings during rush hour traffic on the 101 freeway near Oxnard, Calif. Commuters are being treated to a nostalgic experience by a DC-3 that has been seen flying down the interstate, not at a safe altitude of 1,000 feet above the roadway, but driving in the outside lane right next to them! Painted to look like a NASA space shuttle, the vehicle has a distinctive interplanetary look about it. One can easily envision it pointed skyward, strapped to a rocket booster sitting on a launch pad at the Cape. In reality, it’s a DC-3 that has had its wings and tail clipped and its fuselage has been mated to a bus chassis. When its big block 427 Chevy engine comes to life, it sounds like a muscle machine that should be burning rubber out at the local drag strip. It’s the name, Space Shuttle Cafe, painted above the windows that reveals its true mission. Phil and Becky Petersen are the proud owners of the unique Space Shuttle Cafe. The shortened Gooney Bird’s 40-foot length still makes it longer than the longest of the stretch limos. Wherever the Petersens travel in this unusual vehicle, it raises eyebrows and evokes public reaction, from beeping horns to waving and thumbs-up approval. On a recent check ride, the Space Shuttle Cafe cruised the Ventura Freeway at a comfortable 50 miles per hour. Stopping for gas was a particular challenge since it attracted people wanting to peek inside. According to Petersen, the surprising part of owning such a unique attraction is the questions he gets. When working events like an air show, both adults and kids ask if the Space Shuttle Cafe has been into space. “People are shocked when you tell them that you drove it here,” Petersen further revealed. For Oxnard resident Phil Petersen, the Space Shuttle Cafe was an amalgamation of his love for aviation with his passion for cooking. “My vision has always been to take a unique type of vehicle, aircraft related, and turn it into a food kitchen,” he said. 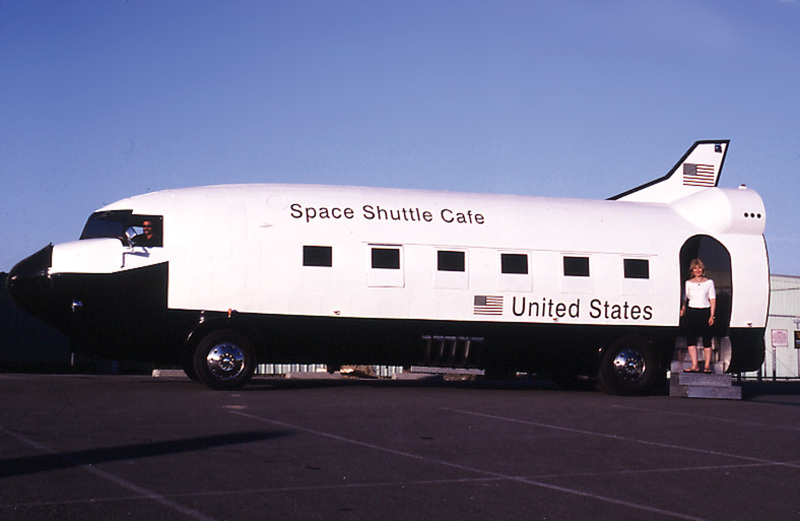 For an aviator who built his own Long-EZ and is a food industry professional, the Space Shuttle Cafe brought both worlds together. It was about five years ago that the Petersen’s discovered the already converted DC-3 in an open field in Beaumont, Calif., adjacent to a sales lot for mobile homes. The unique vehicle was in poor condition. Its paint was peeling, side windows were broken, the nose was damaged and the engine wouldn’t start. 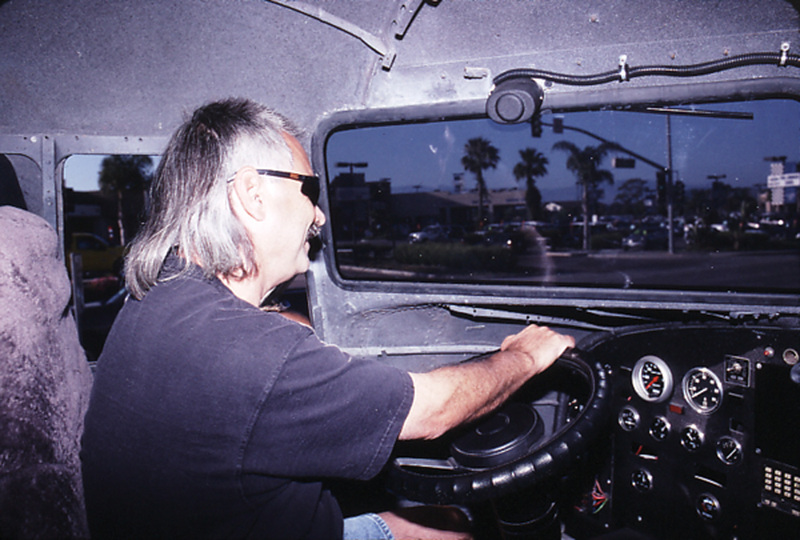 A front profile of the converted Gooney Bird with Phil Petersen behind the wheel. The Petersen’s paid $7,000 for the ailing former airframe now on wheels. After four years of intensive work and an investment of $100,000, their dream-mobile was totally rebuilt, outfitted as a completely self-contained rolling kitchen. Their first paid gig was a California car show in December 2004. With the exception of the front suspension and rear-end, everything else had to be replaced. Mike Flynn, a retired metal worker, helped Petersen do the work. A new big block Chevy engine was installed along with a turbo 400 transmission. The wiring for the interior 110-volt electrical system was all replaced. The wheels were converted to disc brakes. 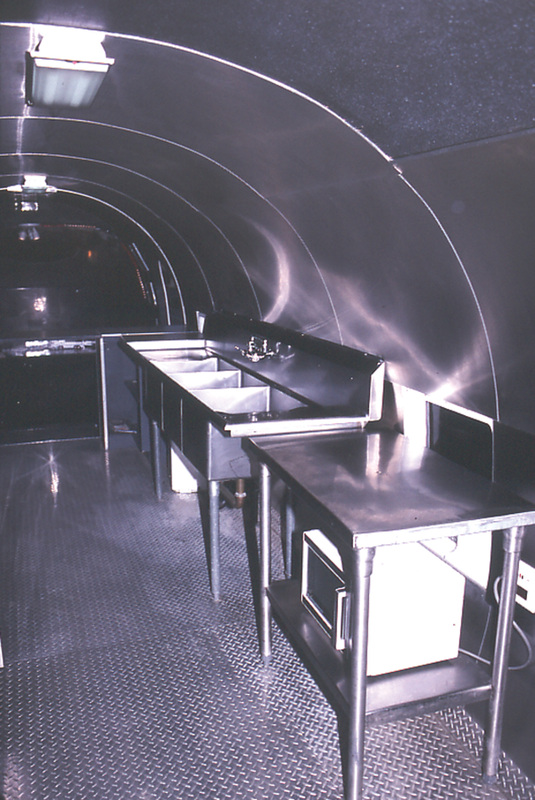 Petersen and Flynn designed and installed a complete commercial grade restaurant style kitchen. The equipment, all stainless steel, included a four-burner grill, two deep fryers, a three-compartment sink, a microwave and two refrigerators. It has its own generator plus hot and cold water. Everything meets California’s strict food safety standards. When the kitchen is in full operations at an air show, the Petersens and their staff of up to five people can serve up almost anything from the typical hamburgers, hot dogs, chicken and french fries to more complete dinners for special affairs. Orders are taken at the rear of the Space Shuttle Cafe, with customers entering from one side door, placing their order, receiving their food, and then exiting through the other side door. There’s a display case in the rear containing memorabilia and pictures of a real space shuttle and hidden mementos found during restoration efforts, such as actual airline schedules for both Allegheny and Argonaut Airways, each of which operated this DC-3 in scheduled service. The Gooney Bird was delivered to the U.S. Army as a C-47A on March 31, 1944. It later entered civilian life, flying for the Hughes Aircraft Company. This was followed by commercial airline service with All American Aviation (A predecessor to U.S. Airways), Allegheny Airlines, Argonaut Airways and Southeast Airlines. During the 1960s, it survived being hijacked to Cuba. After flying for several different corporate owners in Florida, it was delivered to a scrap dealer at Ryan Field, Arizona (near Tucson) in 1972. There it languished under the threat of being cut up by the scrapper’s blade until 1977, when H.L. “Smokey” Roland showed up to save the day. Roland was a free spirit who lived in Cardiff-by the Sea, Calif. He was looking for a DC-3 fuselage that would be suitable for a camper. After saving the former Allegheny Airliner from total destruction, he carved up the DC-3, mounting the forward 40-foot fuselage section to a bus chassis. Although, the conversion was a little crude, it served his purpose. He had built the world’s first street legal DC-3. 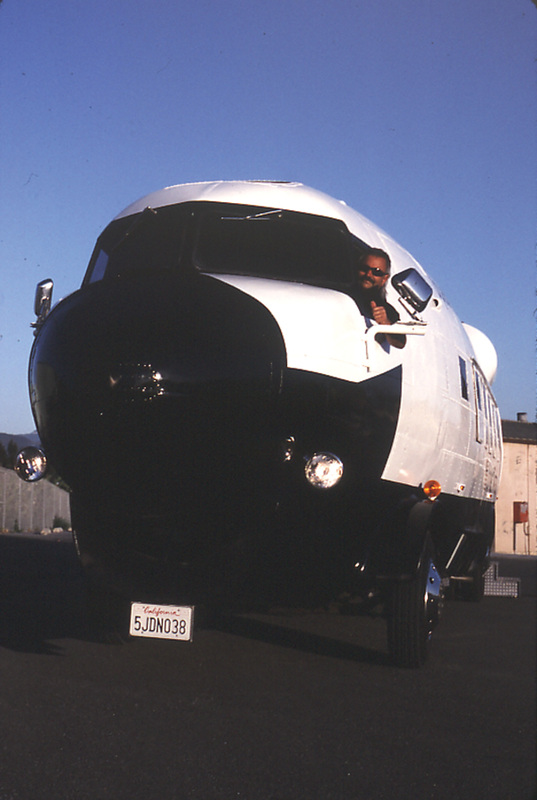 After adding 80,000 highway miles to the airframe and barnstorming the country, Roland sold his creation to Robert and Heike Pfeiffer of Leucadia, Calif., in 1982. Phil Petersen driving the Space Shuttle Cafe. Pfeiffer, who had a penchant for remodeling, worked on the unique vehicle for six months before experiencing the revelation that determined the DC-3’s next reincarnation. It came while watching a landing of the Space Shuttle Columbia. Pfeiffer performed a 95 percent rebuild, reportedly investing $250,000 in labor and material to transform the camper into a space shuttle theme. He added an official looking space shuttle paint job. Its crowning glory was an eight-foot diameter Plexiglas bubble on the rear with four rocket-like housings that double as tail and brake lights. The floor was covered with black carpeting and a white Naugahyde material provided the wall covering. An awesome spacescape of the solar system adorned the ceiling, completing the replica shuttle’s interior design. The remodeled Gooney Bird was named the “Smile Shuttle” because it created so much excitement and goodwill. Pfeiffer timed its debut to coincide with the premier of the movie “Star Trek II.” He had hoped to recoup his investment by leasing the vehicle out for public relations campaigns. The “Smile Shuttle” attended numerous special events, sometimes as a static display, mobile showroom, hospitality suite and even a parade float. In 1984, it was transported to Germany to be the featured attraction at the Essen Motor Show. On one occasion, it traveled to Edwards Air Force Base to join all the other motor homes waiting for the real space shuttle to land. For the Pfeiffers, the “Smile Shuttle” had finally reached orbit. The Pfeiffers eventually sold the “Smile Shuttle.” It appears that during the 1990, the vehicle fell into a long period of neglect and disuse. Just like in a fairy tale, it fell into a deep sleep, only to be awoken again, this time by the Petersens. Thanks to them, the Gooney Bird is now enjoying yet another reincarnation, this time as the Space Shuttle Cafe. They’re providing a unique food service with a special aeronautical twist as they travel to special events throughout Southern California. For the Petersens, the Space Shuttle Cafe is their fairy tale come true. 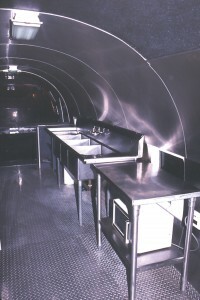 For more information on this innovative food service, visit [http://www.spaceshuttlecafe.com]. The immaculate commercial grade stainless steel kitchen.